The smell of high-tech regulation is increasingly in the air these days and many lawmakers and some activist groups now have the mobile marketplace in their regulatory cross-hairs. 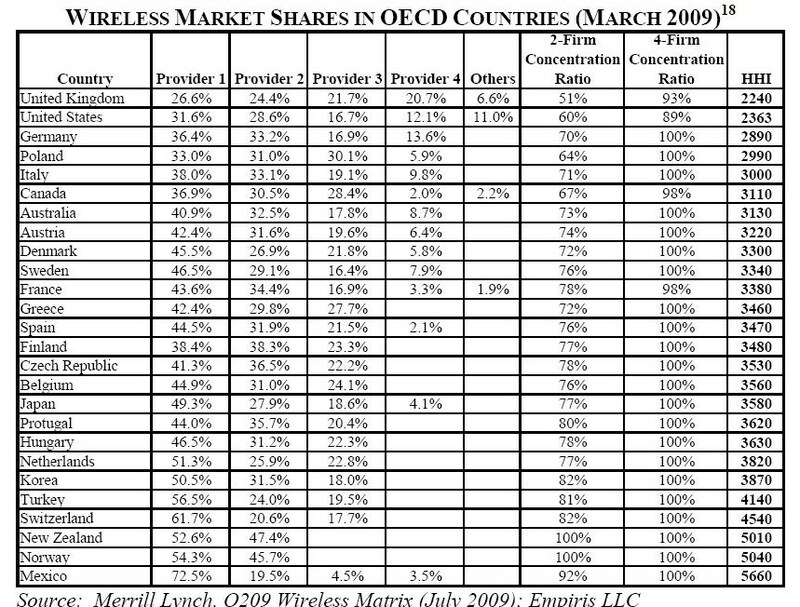 Critics make a variety of claims about the wireless market supposedly lacking competition, choice, innovation, or reasonable pricing. Consequently, they want to wrap America’s wireless sector in a sea of red tape. Two important new studies thoroughly debunk these assertions and set the record straight regarding the state of wireless competition and innovation in the U.S. today. These reports are must-reading for Washington policymakers and FCC officials who are currently contemplating regulatory action. the three segments of the wireless marketplace (applications, devices, and core network) have exhibited very substantial innovation and investment since its inception. Perhaps more interesting, innovation in each segment is highly dependent upon innovation in the other segments. For example, new applications depend upon both advances in device hardware capabilities and advances in spectral efficiency of the core network to provide the network capacity to serve those applications. Further, we find that the three segments of the industry are also highly competitive. There are many players in each segment, each of which aggressively seeks out customers through new technology and new business methods. The results of this competition are manifest: (i) firms are driven to innovate and invest in order to win in the competitive marketplace; (ii) new business models have emerged that give customers more choice; and (iii) firms have opened new areas such as wireless broadband and laptop wireless in order to expand their strategic options. Having found that all three segments are highly competitive, we ask, where is the market failure? If none, then the principle of customer-centric applies: let customers make the key decisions regarding which products, services, open vs. managed business models, net neutrality, et al. will survive in the marketplace. While there is no shortage of pundits, advocates, lobbyists and academics advising the FCC that it, rather than customers, should be making these decisions and advising the FCC what those decisions should be, a customer-centric FCC must leave these decisions to customers in a competitive marketplace. Should the FCC decide to preempt customers and make choices for them, it follows as does night from day that the result will be (i) less customer choice, and therefore reduced customer well-being; (ii) higher costs for producers and therefore customers; (iii) lower incentives to invest and innovate, harming customers, producers and the American economy. In this case, economics and technology are on the same page: economists advise intervention only in the case of demonstrated market failure, and then only if there is evidence that the intervention will do more good than harm. The technologist’s advice is more pithy and down to earth: if it ain’t broke, don’t fix it! Amen to that. Let’s hope our lawmakers are listening. Like the Faulhaber-Farber paper, the Ehrlich-Eisenach-Leighton paper examines the major segments of the wireless marketplace — applications, devices, and networks — and shows them all to be vigorously competitive and experiencing significant innovation. 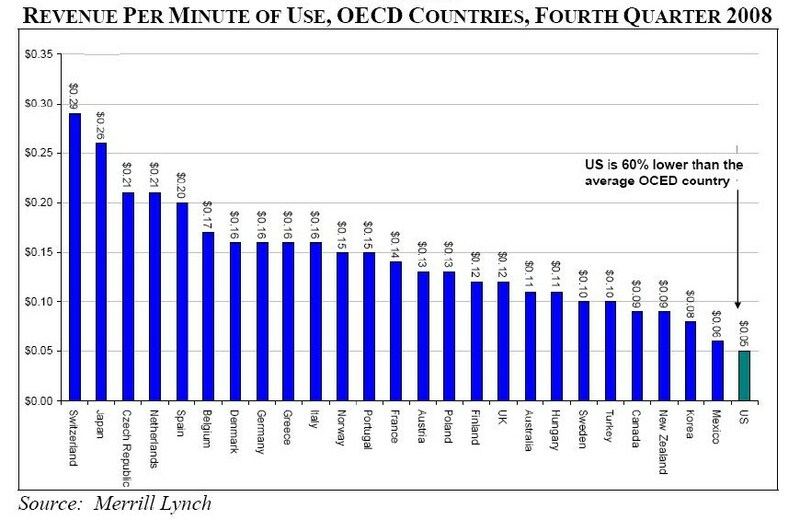 Some of the following tables and charts help to illustrate this. 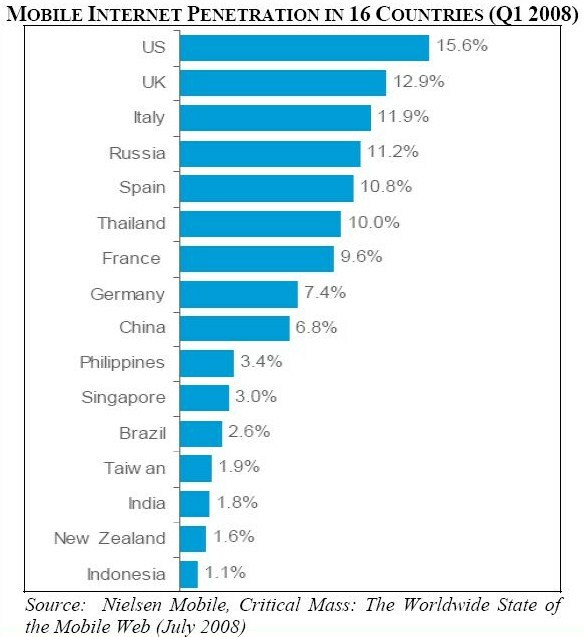 This first table shows how concentration ratios for the U.S. market (as measured by HHI) are among the lowest in the world. 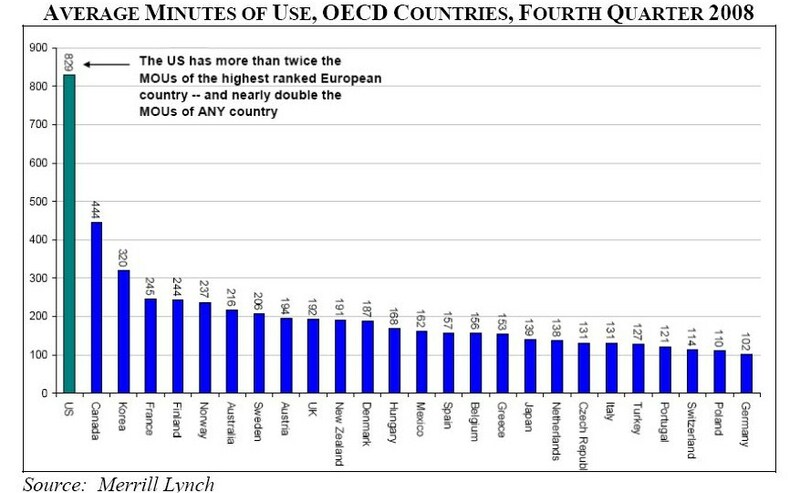 The next two charts show that U.S. carriers have the lowest revenue per minute (60% lower than the average OECD country) even though average minutes per use are more than twice the amount of the next highest ranked country (Canada). On the metrics that seem to be of greatest concern to regulation advocates – choice and innovation – the data also show the industry is performing well. For example, CTIA reports there are more than 630 different wireless handsets and devices available in the U.S., compared with only 147 in the United Kingdom, and notes that many of the most advanced handsets introduced in recent months have been launched in the U.S., including (among others) the iPhone 3G, the Google G1, and the Blackberry Storm. Amazon’s highly popular Kindle was also launched in the U.S. with connectivity provided by Sprint – while its European launch was delayed for a full year by Amazon’s inability to reach agreement with a mobile carrier there. As noted above, the number and variety of available applications is increasing rapidly: In addition to the Apple Apps Store, application downloads are now available from the Android Market (Google), the Palm Software Store, Blackberry App World and the Nokia Ovi Store, offering a total of more than 60,000 different applications. On July 14, 2009 Apple announced that more than 1.5 billion applications had been downloaded from its iPhone App Store since its launch in July 2008. Actually, that number is even higher now. As I noted here recently, in just a little over a year, Apple reports there’s been 2 billion downloads of over 85,000 apps from over 125,000 developers. It’s just stunning when you think about it. I encourage everyone to read both reports cover-to-cover. They provide a comprehensive look at the reality on the ground — or in the air, as the case may be — in America’s mobile marketplace.